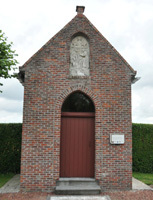 This penance chapel dates from 1727. Here is how it came to be there. In the night of 15-16 June of that year a thief broke into the church and stole the sacred vessels. Among these was a ciborium whose holy contents was unceremoniously dumped in a ditch. Who done it ? On 19 June 1728 the 18 year old Jacobus De Gryse, fs. Jan, born in Leffinge, near Ostend, was condemned to death for this and other similar crimes. His hands were hacked off, the usual punishment for sacrilegious thefts, he was then hanged, his corpse was burned and the ashes dispersed on the gallows field. Those of you who read Dutch can find out more about it here in this article published in the quarterly "Ons Meetjesland". The chapel was built on the spot where the holy hosts were found. This became then a pilgrimage destination. A well was sunk and the water was used to treat whooping cough. The chapel was recently renovated and this was very well done except for the bas-relief above the entrance. If this bas-relief is not removed or restored within the next few months nothing much will be left of it. It is just simply crumbling away exposed to the elements as it is. In our humble opinion the best solution might now be to have it removed by experts—let's hope it will stay in one piece—and to replace it with a copy in hard stone. Why not keep the original inside the chapel or expose it in the church, perhaps protected with a pane of nonreflecting plexiglass. We hope the greater-St.-Laureins burgomaster and council will act responsibly and with due diligence to give a future to the town's past. of this chapel or this bas-relief.